COMMENTS : I too would love a luxurious camel coat. However I'm not sure this looks like it would be worth the money- id have to see it in the flesh to decide. I would be happy to spend that much on a coat but I would have to absolutely love it and this is not quite there for me yet. I would prefer something more fitted eg nipped in at the waist. There is just nothing interesting about the design. COMMENTS : Beautiful color, but i'd rather buy a winter coat in the trench coat style. It's more versatile. 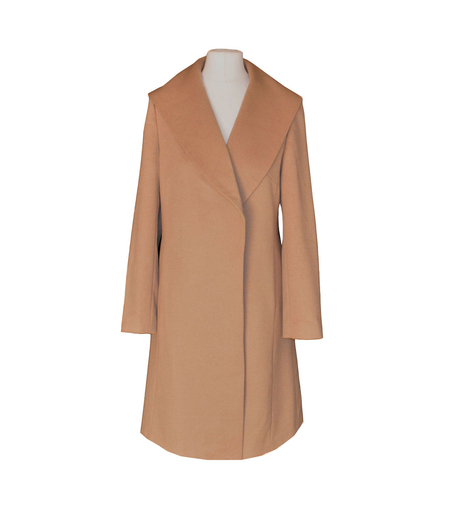 COMMENTS : I have been search for a camel coloured coat all winter, and everything on the high street just drowns me! The colour is perfect, richer than a lot of other designs out there. However, I think the lapels need to narrower on a petite lady. Also, the closure just isn't very practical for winter, I would prefer either a single line of buttons or a trench coat style (like a wool Burberry mac idea!). I really love the sash around the waist, and perhaps the coat needs to follow that shape more to really nip you in. It's a really pretty detail and much more fun than a belt! COMMENTS : I will buy this 100%, the color is so beautiful and rich. I've been looking for a camel colored winter coat, but the "camel" color at other stores have been more in cream color. Could you make the Lapels narrower? COMMENTS : Expensive but worth the investment. COMMENTS : I love this coat, quite expensive but worth the money.